The Moonlandingz make a hat trick of announcements including news of a 2017 Liverpool date. Getintothis’ Vicky Pea is here to claim the assist. 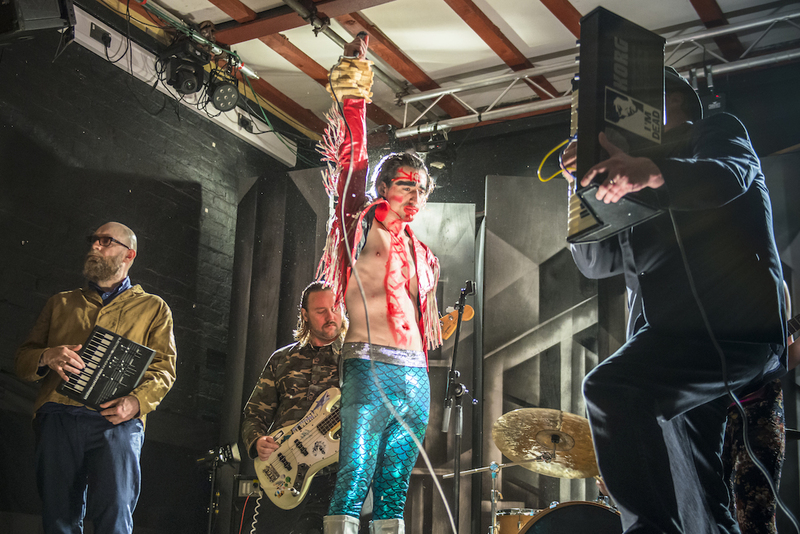 For a fictional band, The Moonlandingz are making some very real headway. Only months removed from a manic but widely applauded appearance at Liverpool Psych Fest, Johnny Rocket and co have revealed their intentions to return to the UK next year, including a return date in Liverpool where they will play the Invisible Wind Factory in what is sure to be an artist/venue match made in heaven. Not only will this tour take in some of their biggest shows to date but they’ve also promised to release the “first great album of 2017” with their official debut record Interplanetary Class Classics set to be release via Transgressive Records in March. To whet the appetite the band have released the first track from the record, Black Hanz, alongside a Brexit inspired video filmed in Sheffield. “We wanted to make a video that kind of surreally highlighted these hideous Brexit times we are living in, this kind of intolerance that people have towards people who might be a little different, or not the same as them. It’s like the 70’s again, we can’t walk 500 yards down the street without some fucker saying some smart-arse comment or spitting or wanting to attack us. The Moonlandingz play the Invisible Wind Factory on March 25 2017. Full tour dates are below, tickets go on sale Friday December 2 2016 at 10am. Check out their latest single The Strangle of Anna here to get you in the mood for show.